Easter feels early this year, I think I always feel that way when we celebrate in March. We’re just about a month away which means I can begin to craft and plan all kinds of bunny related creations. Today I’m sharing an Easter Bunny mason jar with you, and my talented friends are sharing Easter mason jars too! 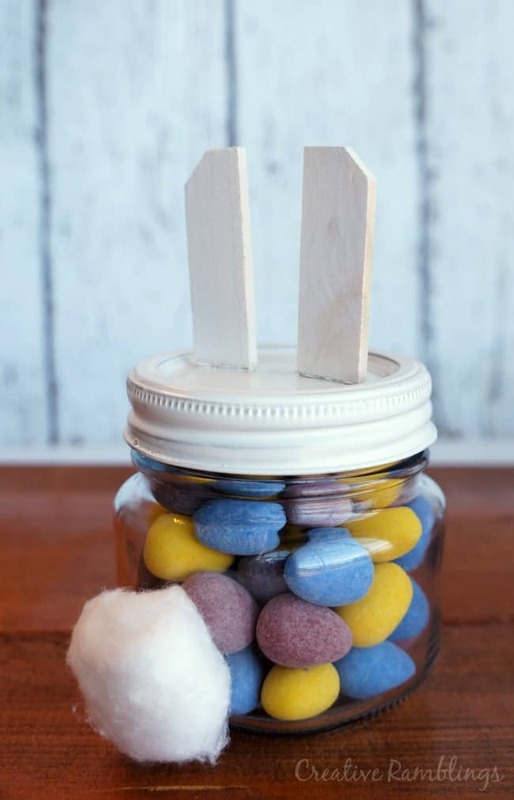 Take a look at how easy this simple candy jar is to make, then scroll down to be inspired by some other beautiful Easter projects. Be sure to Pin this Easter Bunny Mason Jar. You know you’ll want to come back and make one when you start to fill your Easter baskets. I was inspired to created this little jar by these funny wood pieces. 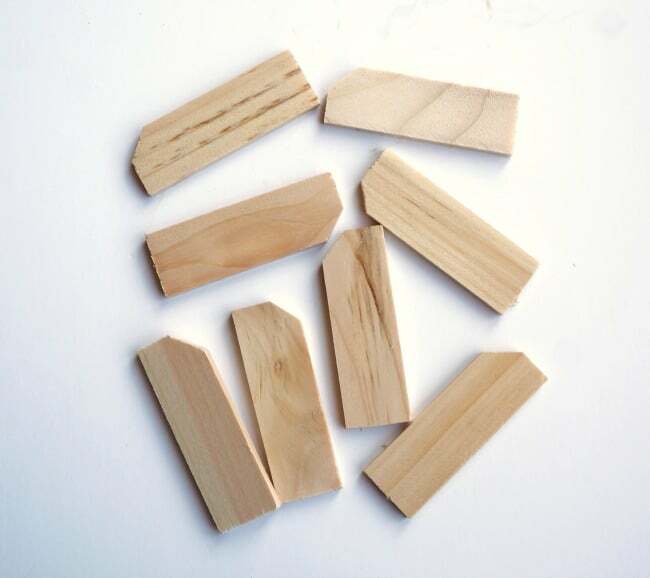 They came with a canvas I purchased, you can use them to stretch and support the canvas after painting it. I didn’t use them but hung onto them thinking maybe I could use them for something else down the road. And so I did! Don’t they make the cutest bunny ears? I hot glued 2 of these wood pieces to the top of a mason jar lid, then spray painted it white. 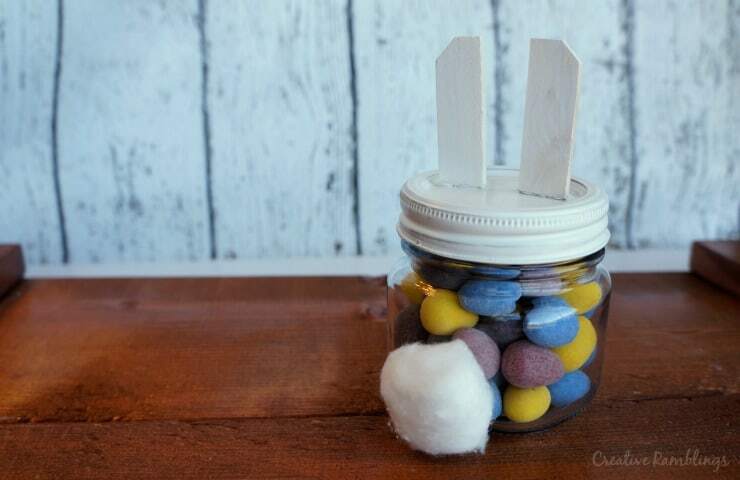 I filled the jar with chocolate candy eggs then glued a cotton ball to the back. An adorable little bunny and a simple Easter gift. I have a bunch of these wood pieces so I plan on making and gifting a few of these Easter bunny mason jars this year. They can be filled with jelly beans, peeps, or just about anything colorful and fun for Spring. 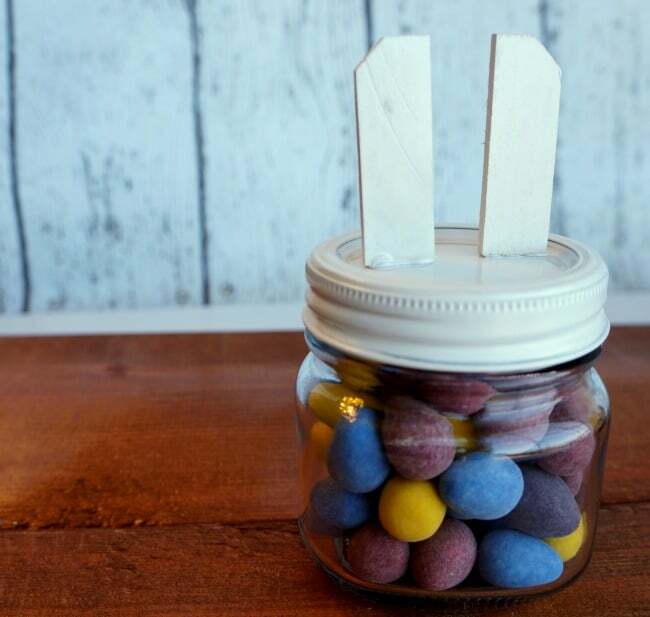 I chose dark chocolate candy eggs for this jar, that’s the perfect Easter candy for me. Be sure to click over for the full tutorials and to pin and share these projects. Adorable and so simple – love it! Pinned! What a smart idea! Super cute!